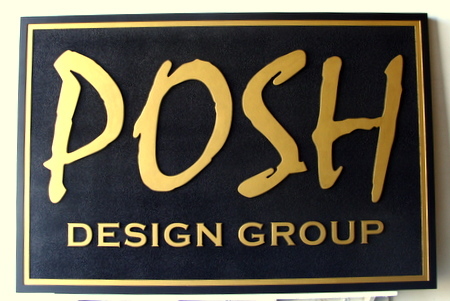 This beautiful and elegant, yet simple, carved High Density Urethane sign is well-suited for a design group sign. Text and border are raised and painted with metallic gold paint and the background is sandblasted lightly in a sandstone texture. It can be mounted on a wall or hung from a wood beam or wrought iron scroll bracket.